iMacsoft iPad Mate is a professional application for Apple iPad tablet users to backup iPad music, movie, photo, ePub, pdf, audiobook, Podcast and TV Show to PC, export media files from PC to iPad, and transfer iPad to iTunes. Moreover, the iPad Mate can convert DVD movies, videos and audios on your PC to iPad movies and music as iPad Video Converter, DVD to iPad Converter and iPad to PC Transfer. iMacsoft iPad to PC Transfer can help you fast transfer, copy and manage your Music, Movie, Photo, ePub, PDF, Audiobook, Camera Roll (iOS 4 above), Ringtone, Contact, Podcast, TV Show from iPad and PC. And get sync iPad files to iTunes library. Moreover, iMacsoft iPad to PC Transfer also allow you to transfer iPhone SMS, Contact, Call List from iPhone to PC for sharing and backup. iMacsoft DVD to iPad Converter can easily convert almost DVD movies to iPad video MPEG-4, H.264/MPEG-4 AVC and iPad audio MP3, M4A, AAC fast and easily. And the converted files can be played perfectly on all types of iPad/iPod/iPhone, such as iPad, iPad 2, the new iPad, iPad mini, iPad 4, iPod touch, iPod touch 4, iPod shuffle, iPod shuffle 6G, iPod nano, iPod nano 5G, iPod nano 6G, iPhone 3, iPhone 4, iPhone 5, iPhone 5S/5C, iPhone 6/6 Plus as a perfect movie DVD player on your hand. iMacsoft iPad Video Converter allows you to convert all popular video files including AVI, DivX, MKV, XviD, WMV, MPEG, MPG, DAT, RM, MOV, ASF, VOB, FLV to iPad video MPEG-4, H.264/MPEG-4 AVC and iPad audio MP3, M4A, AAC formats for playback on iPad, iPad 2, the new iPad, iPad mini, iPad 4, iPod touch, iPod touch 4, iPod shuffle, iPod shuffle 6G, iPod nano, iPod nano 5G, iPod nano 6G, iPhone 3, iPhone 4, iPhone 5, iPhone 5S/5C, iPhone 6/6 Plus. The iPad Mate software pack is absolutely the must-have for any iPad user! Download it for free and have a trial! iMacsoft iPad to PC Transfer is easy-to-use iPad to PC transfer, iPad rip, iPad backup software can fast transfer, rip, copy and manage your Music, Movie, Photo, ePub, PDF, Audiobook, Ringtone, Contact, Podcast and TV Show from iPad to PC. All formats compatible with iPad/iPhone/iPod are supported. Moreover, iMacsoft iPad to PC Transfer helps you transfer iPhone SMS, Contact, Call List from iPhone to PC for sharing and backup. 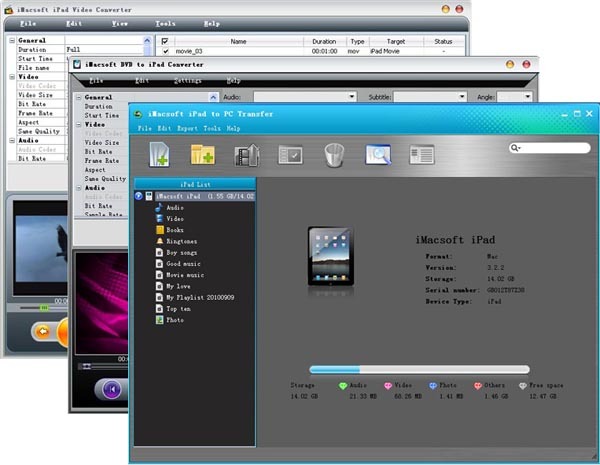 iMacsoft DVD to iPad Converter is easy-to-use and powerful DVD to iPad converter software for iPad, iPad 2, the new iPad, iPad mini, iPad 4, iPod touch, iPod touch 4, iPod shuffle, iPod shuffle 6G, iPod nano, iPod nano 5G, iPod nano 6G, iPhone 3, iPhone 4, iPhone 5, iPhone 5S/5C, iPhone 6/6 Plus. iMacsoft DVD to iPad Converter can easily convert almost all kinds of DVD movies to iPad video MPEG-4, H.264/MPEG-4 AVC and iPad audio MP3, M4A, AAC with the latest H.264 video encoding technology. iMacsoft iPad Video Converter is a powerful and easy to use iPad Video Converter tool which can convert video to iPad video and audio formats for iPad, iPad 2, the new iPad, iPad mini, iPad 4, iPod touch, iPod touch 4, iPod shuffle, iPod shuffle 6G, iPod nano, iPod nano 5G, iPod nano 6G, iPhone 3, iPhone 4, iPhone 5, iPhone 5S/5C, iPhone 6/6 Plus.